Being quiet and having a 6speed gearbox goes a long way. When combined with it's fuel efficiency and a 4.7gallon IMS tank the WRR would have considerable mileage. 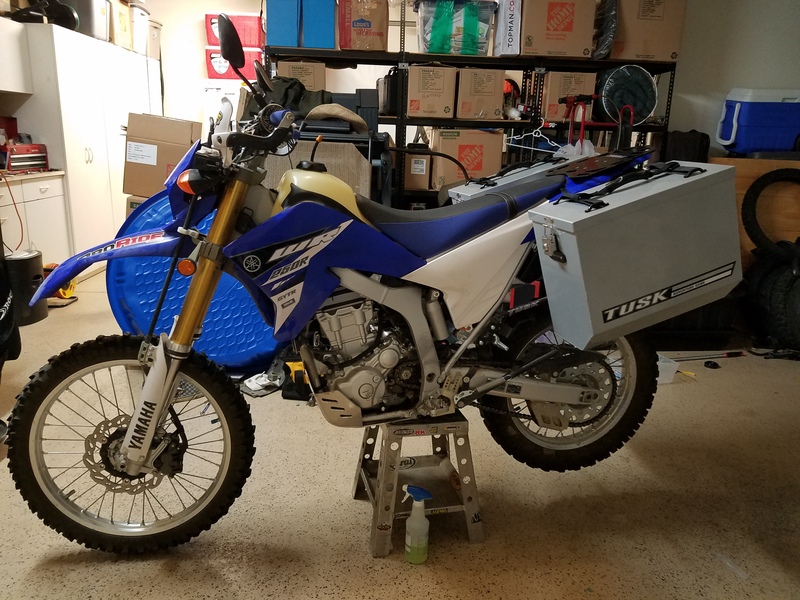 At this point I consider it a better option for This trip than my WR450F. I thought about a DR650 but want lighter / better stock suspension. A DR350 would be a fair alternative but older and less refined. I'm not certain I'd keep the bike long term - I may just buy it for the trip and sell it soon(ish) after [unless I fall in love with the bike]. Does anybody currently own one or have past experiences? I have never ridden one and would like to take one down the block before I make a potential long drive to shop for one. IMS 4.7 and Giant Loop would be an ideal setup. Seat Concepts seat and LED lighting to top it off. Big Dog on ADV has put over 50,000 miles touring with his WRR including thousands of Baja miles. He recently 'upgraded' to a new KTM 350 after years of riding the WRR (still owns the WRR though). Any idea how much he paid and/or the condition of the bike? They seem to be priced absurdly high on the used market. Not sure if the sellers get what they are asking but who knows if there is the demand..
No idea bone stock besides cheap handguards and seat concepts seat. Think has under 5k miles was used for commuting. One thing you don't need is another bike.....IJS. Absolutely. I'd consider just renting a bike for the trip! Just an fyi Goofy, last summer while riding the BDR CO, I passed one loaded up and rode alongside another loaded up. I had a chat with both fellas (because it was what I was initially shopping for as a light weight adventure bike - but given my body weight (much more than yours) and my disease of overpacking (likely much more than you do), decided to get a few more cc to pull me and my suitcases up the steeper grades). They had their bikes for quite sometime and had no intention of getting a bigger bike. They just cruised along nicely with the mind set of simply cruising along without needing to zip zam zoom bam bam all the time. They were happy and the fella I had just passed going the opposite direction was elated that he had just called upon all the 250cc's to scoot by a big bear . As you made reference to,...... quiet, smooth, 6 speed, etc. sure are nice, and you have extensive yamaha knowledge, and yep, they seem to have high used market value. Maybe you can find a hefty fella who will trade 450 for 250. Good luck. I owned one, was good for the cost, it's low in power but had enough to get by, a few things. If you take it to elevation you are really really low on power, I regeared it for altitude, if I can remember I went up 5 on the rear. It worked but speaking from experience, you you add luggage and weigh a decent amount, change the rear shock or already revolve it. The rebound has no control resulting in a vicious wobble the will throw you off at 65mph. Other than that. I rode mine like I stole it every time I rode it. Full digital throttle. Pokey how many miles did you put on your WRR?